On behalf of the staff and the Board of Advisors, I am pleased to present this first annual report on the activities and progress of the JC Raulston Arboretum in calendar year 2006, the 30th anniversary of the JCRA. The past year has been not only a year of growth and development for the Arboretum, but for myself and the staff also, as I completed my first year as director, and two new members joined the Arboretum staff. Our priorities this year focused on care and maintenance of the collections, assessment of current collections, infrastructure improvement, and planning for future renovation of various gardens in the Arboretum. 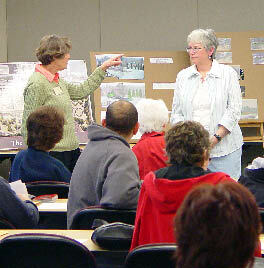 The Arboretum offered a diverse series of educational programs in 2006, including numerous Friends of the Arboretum Lectures, workshops, field days, and a symposium. We have done major work on various garden areas, including the West Arboretum, the A. E. Finley Foundation Rooftop Terrace, and the Stepping-stone Water Garden. Demolition of the old Arboretum brick building was completed, opening up new garden space. We have placed increased emphasis on interpretative and educational signage to complement our already excellent plant labeling signage. Numerous new plant accessions were acquired and integrated into our existing collections. The Arboretum has acquired two additional acres of land to facilitate future expansion of the collections. The Arboretum continued its important role as a vital resource for the academic programs of NC State University, strengthened its identity as an important community and regional educational resource, and remained a major outreach arm of NC State University for the green industry in North Carolina. Membership increased by 11.5% in 2006. The Arboretum embarked on an exciting Grassroots Master Plan to develop a new system of paths and garden spaces to enhance our collections and the visitor experience. This is an exciting time for the Arboretum. During the coming year, the vacant assistant director position will be filled, and we will refocus on our historical efforts in new plant acquisition and testing. The Arboretums efforts in plant breeding are resulting in the development of new plants with exciting ornamental potential. Renovation of existing garden spaces will continue. Our educational programs will continue to teach our members and visitors about the satisfaction and challenges of gardening in Piedmont North Carolina. We invite you to join us and share in the collective joy of working with plants as the JC Raulston Arboretum enters its 31st year of educating and inspiring students, the green industry, and the public. We encourage you to help us fulfill our mission by becoming a member, recruiting new members, sharing your time and talent by becoming a volunteer, and by making a financial contribution. We look forward to 2007 and beyond, and the exciting opportunities for the Arboretum. Thank you for your interest and support. A grant from the horticulture honor society Pi Alpha Xi (PAX) funded the restoration of the popular Stepping-stone Water Garden. Originally installed by landscape horticulture students in the 1980s, this garden is a special space for kids and kids-at-heart. In addition to the repair of the actual water feature, the entire area was replanted with many new herbaceous and woody plants. An opportunity to showcase xeric plants was made possible through the construction of a new scree garden on the west side of the Ruby C. McSwain Education Center. More than 200 new plants, including taxa from the southwestern United States, Mexico, and South Africa were established in this exciting new planting. Of particular interest are a collection of new hybrid rain lilies (Zephyranthes) and ferns from the desert southwest. This garden demonstrates the exciting opportunities for landscaping with taxa that require little or no supplemental irrigation after initial establishment. Renovation of the beds lying west of the Ruby C. McSwain Education Center began in mid 2006 with the removal of old collections by the staff and summer interns. Removal of large trees, development of new paths, soil amendment, and bed reconfiguration is being done in anticipation of replanting in spring of 2007. Keep an eye out for changes in this part of the Arboretum. Thanks to a generous gift from Priscilla Swindell, and the creativity and efforts of students in the landscape horticulture class of Pat Lindsey, Ph.D., in the Department of Horticultural Science, the Swindell Contemplation Garden was established. Lying under the welcoming arms of our two beautiful live oak trees, this garden features a diversity of shade tolerant plants, many with winter interest. The gardens in the A. E. Finley Foundation Rooftop Terrace are undergoing a complete renovation to facilitate culture and trialing of a greater diversity of plants. Modification of the growing media and reconfiguration of beds is nearly complete in anticipation of establishing new plant materials in spring 2007. A favorite location for weddings and other events, the rooftop garden area provides guests with a great view of the West Arboretum. The old Arboretum "brick building," an icon of the Arboretum for many years, was demolished in late 2006. Long used as a classroom and for various Arboretum purposes over the years, the building was in advanced disrepair. The site will be renovated and new plantings established in 2007. We were pleased to welcome two new staff members in 2006. Autumn Keck joined us as associate director of membership and fund-raising events in March 2006. Autumn is a 2000 graduate of NC State University with a degree in communications, responsible for coordinating our member recruitment and fund-raising efforts, and coordinating fund-raising events such as our Gala in the Garden. Tim Alderton joined the JCRA in February 2006. Tim has a horticulture degree from the Pennsylvania State University. Tim filled the research technician position, and is responsible for general care and maintenance of the Arboretum grounds and plant collections. The JCRA assistant director position is currently vacant, but will be filled in 2007. Thanks to the generous contributions of Alan McIntyre, Bobby Wilder, the Raleigh Garden Club, the North Carolina Association of Nurserymen (now the North Carolina Nursery and Landscape Association), and the North Carolina Commercial Flower Growers Association, the Arboretum was able to host four student interns in 2006. These students obtained a broad range of experiences in the care and management of the Arboretum collections. The Arboretum offered 18 Friends of the Arboretum Lectures and four workshops in 2006, covering a diversity of topics and speakers. Special events included our first annual JCRA Summerfest, offering numerous educational programs for the gardening public. Over 400 people attended to hear presentations on earth-friendly gardening, beekeeping, turf management, herbaceous perennials, irrigation, designing for small spaces, attracting wildlife, and other topics. The highlight of the 2006 educational programs was the JCRA 30th anniversary symposium entitled "Plan – and Plant for a Better World," in honor of the late founder of the Arboretum, J. C. Raulston, Ph.D. One hundred and seventy-five attendees were treated to a terrific educational program, highlighted by keynote speaker Roy Lancaster. 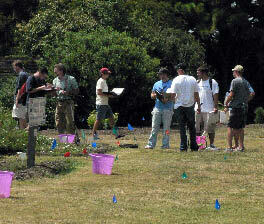 The Arboretum provides a valuable teaching resource for numerous faculty at NC State University. Students in Ornamental Plants I and II, Plant Systematics, Nursery Management, Tree and Grounds Maintenance, and Plant Propagation classes benefitted from the availability of the Arboretums diverse collections. The Arboretums extensive collection of Aesculus is supporting a systematics study of this important plant group by a graduate student in the Department of Plant Biology. Researchers in the Department of Forestry and Environmental Resources make use of the collection of Abies species in their research aimed at developing rootstocks for Fraser fir, Abies fraseri. 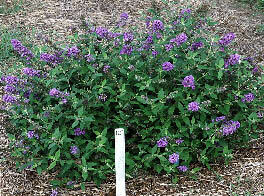 Plant breeding efforts conducted by the Arboretum staff focus on Buddleja, Cercis, and Stokesia laevis. Final evaluation of two compact Buddleja selections with low fertility was completed in 2006 in anticipation of formal release in 2007. Numerous exciting redbud (Cercis) selections are being evaluated in advanced trials and have elicited considerable interest from the nursery industry. A significant percentage of the royalties from sales of future Arboretum cultivar releases will go into the JCRA Endowment for Excellence to generate income to support the long-term care and development of the gardens. We began a new changing sign program to highlight particular gardens and plants during the changing seasons. This effort complements our already excellent program of plant labeling. Our goal is to provide more informal educational experiences for Arboretum visitors. A grant from the Stanley Smith Horticultural Trust was obtained to assist in this effort. The ARC of Wake County, North Carolina, is a non-profit organization whose mission is to assist people with disabilities secure employment experiences in the community. The Arc of Wake County offers a summer internship program entitled Project SEE (Supported Employment Experience) that provides opportunities for young people with disabilities to work in a variety of job settings. 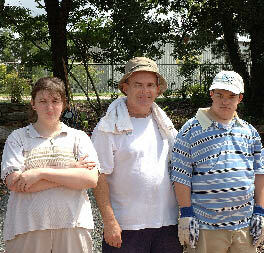 The JCRA was pleased to be a part of Project SEE in summer 2006 by hosting two interns. Our Project SEE interns, Robbie Colondres and Cassie Cunningham, and their job coach, Doug Morris, kept our Visitor Center, Klein-Pringle White Garden, and the Tom and Kathy Rucker Roof Terrace Container Gardens watered and looking great, as well as participating in a number of other garden activities. Completion of the Ruby C. McSwain Educational Center and the accompanying Visitor Center in 2002 significantly changed the physical map of the JCRA. Recognizing that no formal master plan existed for developing the paths and garden spaces in the area immediately surrounding the new buildings, nor for integrating the paths and garden spaces in the remainder of the Arboretum to the new buildings, a "Grassroots Master Plan" was initiated. This effort, led by a team of volunteer landscape designers and landscape architects, is aimed at developing a physical master plan for the JCRA, with emphasis on the path systems, handicapped accessibility, garden spaces, and enhancing the visitor experience. The team has solicited suggestions and ideas from all members of the JCRA community, and is currently in the final stages of developing the Master Plan. The creative students in Will Hookers landscape design class channeled their energies into designing and creating a collection of bamboo fish that have been placed at various locations around the JCRA. This project provided students an opportunity to develop their design skills using bamboo, with the Arboretum as the palette. Children visiting the Arboretum have enjoyed "fishing" in the gardens. Although Bill and Mary Coker Joslin made their property a gift to NC State University a number of years ago, we made great strides in beginning to understand the garden as an extension of the JCRA in 2006. We learned a great deal about the history of the site and its plantings, and prepared a guide for visitors. More than 700 plants were catalogued, 200 of which are now marked with engraved labels. Plant "performances," i.e., flowers, fruits, and foliage, were recorded weekly and were documented in over 1,500 photographs. We were happy to invite the public to enjoy the garden during spring and fall open days, and several small groups visited with private tours. Beyond their sharing this beautiful garden and home through a planned life estate gift, the Joslins pledged to create a generous endowment through outright and planned gifts to be used to support and maintain the property. We look forward to strengthening our relationship with the Joslins, discovering hidden plant treasures, and introducing more visitors to the garden each year. 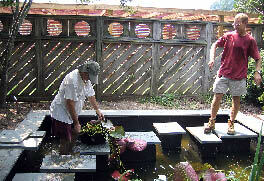 Bob Davis and Tim Alderton place plants back into the water garden after it was renovated. 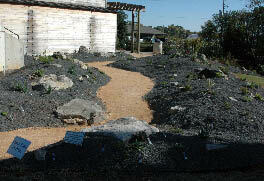 The Scree Garden shortly after being planted. The summer interns and staff remove plants from behind the Southwestern Garden in preparation of future bed renovations. James Lail, Tim Alderton, and Denny Werner planting the Swindell Contemplation Garden. After years of research, most of plants on the roof of the Ruby C. McSwain Education Center were removed in preparation of new planting. The brick building was demolished in December 2006. Autumn Keck works on the 2007 Gala in the Garden. Tim Alderton secures a weeping plant. 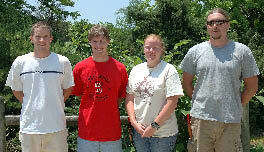 The summer 2006 interns – Ben Pick, James Garzoni, Corley Hughes, and Anthony Beck. 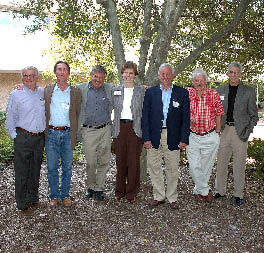 The 30th anniversary symposium speakers – Bobby Ward, Ph.D., Bill McNamara, Peter Del Tredici, Ph.D.; Kim Tripp, Ph.D.; Don Shadow; Roy Lancaster; and Michael Hayman (Roy Dicks not in photograph). Stu Warrens Tree and Grounds Maintenance class learns to apply fertilizers over large areas. A compact Buddleja (butterfly-bush), still unnamed, will be one of the first plants introduced from the Arboretums new breeding program. One of the many new interpretive signs made possible by a grant from the Stanley Smith Horticultural Trust. Cassie Cunningham, Doug Morris, and Robbie Colondres, Project SEE interns and their job coach. Harriet Bellerjeau and Suzanne Edney introduce the Grass Roots Master Plan. One of the many bamboo fish from Will Hookers Residential Landscaping class on display in the Arboretum. The Joslin Garden in spring. Volunteers play a critical role in all aspects of operations of the JCRA. 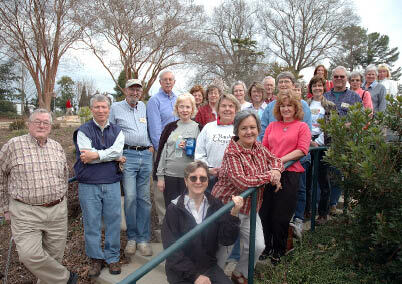 Their willingness to share their time, passion, and talents with the Arboretum enriches our programs and gardens. The staff of the JCRA wish to extend their sincere appreciation to all of our volunteers. 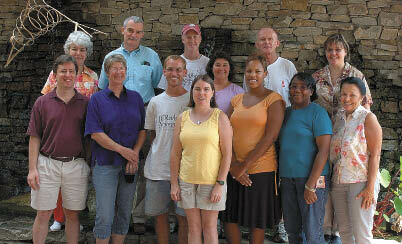 A special thank you to all volunteers that shared over 8,000 hours of their time and talents in 2006. Your volunteer contributions make the JCRA a better place. In addition to our membership, we have also received other special gifts to the Arboretum. Thank you to all these donors for giving us the extra support. The Gala in the Garden is our signature fund-raising event held every first Sunday in May. In 2006, our sponsors contributed over $62,000. Thank you again to the 2006 Gala in the Garden sponsors for making our event a huge success. 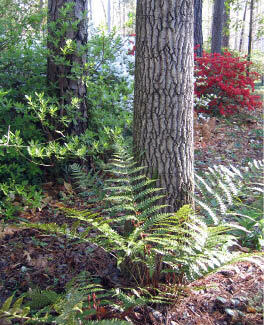 The JC Raulston Arboretum is very fortunate to have another large source of support through gifts-in-kind. These donors are so vital to the success of our events, especially the Gala in the Garden and the symposium. They also provide services and plant materials that keep the Arboretum beautiful for everyone. Creating or contributing to an endowment is a long-term investment that will provide financial stability for the Arboretum year after year. Two new endowments were created in 2006 to benefit the Arboretum. These gifts will be a lasting legacy for each one of these donors. For more information on how you can create an endowment to benefit the JC Raulston Arboretum, please contact Autumn Keck at (919) 513-3826. Written by Denny Werner, Ph.D., with contributions by Frankie Fanelli, Autumn Keck, and Judy Morgan-Davis.